Continuing their commitment to controlling global population growth through artificial contraception, sterilization, and abortion initiatives, Microsoft founder and philanthropist, Bill Gates and his wife, Melinda, a self-described “practicing” Catholic, are now attempting to control the curriculum of the nation’s public schools. Subsidizing the Common Core State Standards in English language arts and mathematics, the Bill and Melinda Gates Foundation has committed more than $76 million to support teachers in implementing the Common Core—a standardized national curriculum. This, on top of the tens of millions they have already awarded to the National Governor’s Association and the Council of Chief State School Officers to develop the Common Core in the first place. Working collaboratively with the Obama administration, the Gates Foundation subsidized the creation of a national curriculum for English and mathematics that has now been adopted by 46 states, and the District of Columbia—despite the fact that the General Education Provisions Act, the Department of Education Organization Act, and the Elementary and Secondary Education Act all protect states against such an intrusion by the United States Department of Education. The Common Core Standards were developed by an organization called Achieve, and the National Governors Association—both of which were funded by the Gates Foundation. The standards have been imposed on the states without any field testing, and little or no input from those involved in implementing the standards. In a post entitled “Why I Cannot Support the Common Core Standards,” educational policy analyst and New York University Research Professor, Diane Ravitch, wrote that the standards “are being imposed on the children of this nation despite the fact that no one has any idea how they will affect students, teachers or schools…Their creation was neither grassroots nor did it emanate from the states." “Fact-based” books on climate change are also replacing classic works of literature because they are viewed as offering students an opportunity to learn “science.” Freakonomics—a book that has already been a favorite of public school teachers—is preferable to Poe because students will learn about the positive effects of abortion on reducing crime rates by reducing the population of those more likely to commit crime. Valerie Strauss of the Washington Post recently reported (February 26, 2013) that there is growing resistance. Alabama, for example, withdrew from the two consortia that are working on creating standardized tests aligned with the standards. Indiana, which adopted the Common Core in 2010 under the state education superintendent Tony Bennett, is now talking about a “pause” in the implementation of the curriculum. Bennett was defeated in the November elections by an educator who opposed Bennett’s support for the Common Core. On February 14, 2013, Missouri legislator Kurt Bahr filed HB616 that prohibits the State Board of Education from implementing the Common Core for public schools developed by the Common Core Initiative or any other statewide education standards without the approval of the General Assembly. An increasing number of parents are voicing their concerns. For example, Tiffany Mouritsen, a Utah mother, blogged that the American Institutes for Research (AIR), the primary source for Common Core testing is a major concern for her: “AIR markets its values which includes promoting lesbian, gay, bisexual and transsexual agenda for teens, and publicizes its client list (including George Soros and Bill and Melinda Gates).” In a column published in January, political commentator Michelle Malkin calls the Common Core a “stealthy federal takeover of school curriculum and standards across the country.” And, she maintains that the Common Core’s “dubious college and career read standards undermine local control of education, usurp state autonomy over curricular materials, and foist untested, mediocre and incoherent pedagogical theories on America’s schoolchildren." The promise of federal funds to states in order to “encourage” them to adopt the Common Core is nothing new. Our government has been doing this both nationally and internationally for decades. In a 2008 book entitled Fatal Misconception, author Matthew Connelly writes that in the 1960s, President Lyndon Johnson leveraged food aid for family planning during crop failures in India, thus creating an incentive for the sterilization program. India’s Ministry of Health and Family Planning admitted that, “The large number of sterilizations and IUD insertions during 1967-68 was due to drought conditions.” Eventually, more sophisticated incentives such as bicycles and radios were used to encourage women to accept sterilization. Connelly writes that under Indira Gandhi in the mid-1970s sterilization became a condition not just for land allotments, but for irrigation water, electricity, ration cards, rickshaw licenses, medical care, pay raises and promotions. There were sterilization quotas—especially for the Dalits (the untouchable caste) who were targeted for family planning. Gates maintains that improvements in health care—including an expansion of the administration of vaccinations—will encourage families to reduce the number of children they desire to have. And, in an ongoing attempt to expand the types of birth control, Gates has spent millions of dollars on research and development. According to Christian Voice, a few years ago the Gates Foundation awarded a grant of $100,000 to researchers at the University of North Carolina, Chapel Hill, to develop a new type of ultrasound described as a “non-invasive form of birth control for men” which would make a man infertile for up to six months. Such strategies have been effective. In fact, the Gates Foundation has been so successful in their family planning initiatives that the United Nations Population Fund (UNFPA) awarded their annual Population Award in 2010 to the Foundation. According to a June 15, 2010 article in Mercator.net, at the awards ceremony, UNFPA executive director Thoraya Obaid cited the Gates Foundation as a “leader in the fields of global health and global development, particularly in promoting excellence in population assistance, including through the design of innovative, integrated solutions in the areas of reproductive health, family planning, and maternal and neonatal health.” The International Planned Parenthood Federation is a previous winner of the United Nations Population Fund’s Annual Award. It is easy to understand why the United Nations Population Fund—a fund which Steven Mosher, the President of the Population Research Institute has exposed as being a direct participant in China’s coercive one-child policy—honored Gates with their prestigious Population Fund award since the Gates Foundation has donated more than one billion dollars to “family-planning” groups including the United Nations Population Fund itself; CARE International—an organization which is lobbying for legalized abortion in several African nations; Save the Children—a major promoter of the population control agenda, the World Health Organization—an organization that forcibly sterilized thousands of women in the 1990s under the pretence of providing tetanus vaccination services in Nicaragua, Mexico and the Philippines; and of course, the major abortion provider, International Planned Parenthood Federation. More than a decade ago, on May 17, 2002, the Wall Street Journal reported that the Bill and Melinda Gates Foundation had purchased shares in nine of the largest pharmaceutical companies valued at nearly $205 million. 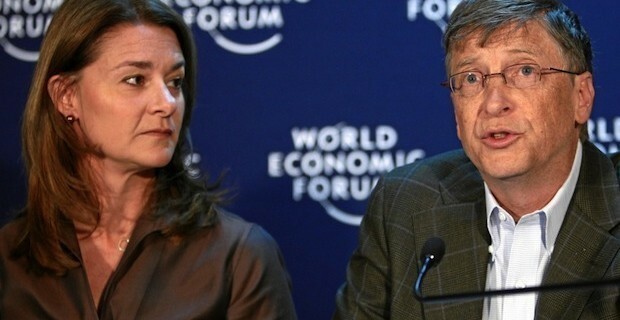 Acquiring shares in Merck, Pfizer, Johnson and Johnson Wyeth, Abbott Labs, and others, the Gates Foundation continues a financial interest in common with the makers of AIDS drugs, diagnostic tools, vaccines, and contraceptives. But, the commitment to global population control goes well beyond financial interests. It is likely that the Bill and Melinda Gates Foundation will continue its commitment to global population control, and now, curriculum creation in the nation’s schools because they truly believe that they know better than anyone else how we all should live. Contraceptives unlock one of the most dormant but potentially powerful assets in development: women as decision makers. When women have the power to make choices about their families, they tend to decide precisely what demographers, economists, and development experts recommend. Most recently, in a January 2, 2013 article published on the Bill and Melinda Gates Foundation website entitled “Profiles in Courage: Philippines Passes Reproductive Health Bill,” the article congratulates all of those who helped bring expanded access to “reproductive health” through the Responsible Parenthood and Reproductive Health Act of 2012—recently signed by President Aquino. This bill states that women and men—living in the most Catholic of Catholic countries—can now “decide freely and responsibly the number and spacing of their children.” What the Gates Foundation website omits is information about the provision within the bill involving “population management” through mandatory counseling of couples seeking marriage licenses. In this case, social justice involves a demand that couples learn about the government’s views on an ideal family size of two children—coming one step closer to China in its government’s one-child policy. This commitment to a distorted definition of social justice by Melinda and Bill Gates will likely continue because they have been lead to believe that such control is what is best for people. The Core Curriculum is really just another component of population control—it is used to help teach children the “facts” about climate change and problems of over-population. Indeed, the population agenda is a trap that many wealthy, highly intelligent people have fallen into in the past. From the wealthy eugenics supporters of Planned Parenthood’s Founder Margaret Sanger, to the Rockefeller family and their population control initiatives, this work continues today through their heirs—heirs like David Rockefeller—an ally of Bill and Melinda Gates. And some influential Catholics have been complicit in this. At one time, Rev. Theodore Hesburgh, President Emeritus of the University of Notre Dame served as a trustee, and later, Chairman of the Board of the Rockefeller Foundation, a funder of population causes counter to the teachings of the Church. The population control initiatives promoted by the Gates Foundation will continue to grow nationally and internationally because they have convinced others and themselves that they are saving lives. On their website, they ask: “what is more life affirming than saving one third of mothers from dying in childbirth?” What they do not seem to acknowledge is how many unborn children have died from their initiatives. Anne Hendershott is Professor of Sociology at Franciscan University in Steubenville. Previously, she taught for fifteen years as a tenured faculty member at the University of San Diego. She is the author of Status Envy: The Politics of Catholic Higher Education and The Politics of Abortion.